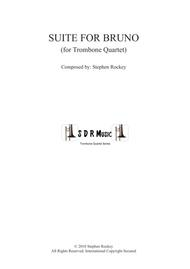 Composed by Composed by Stephen Rockey. Contemporary Classical, Recital. Score, Set of Parts. 72 pages. Published by Stephen Rockey (S0.396209). 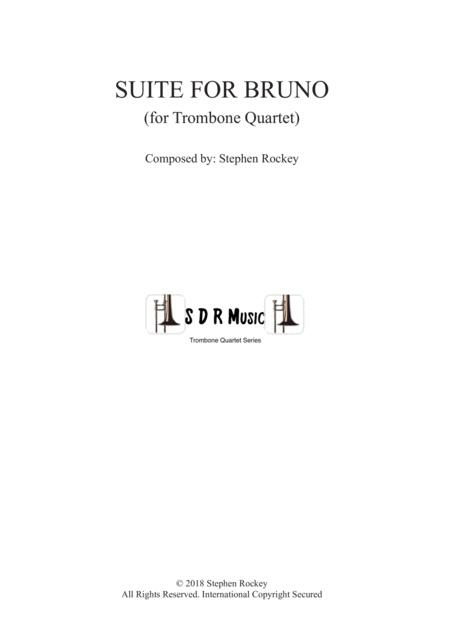 Suite for Bruno for trombone quartet. Composed for a very dear friend of mine who calls all of his pets 'Bruno!' Bass Dance, March of the Doo Doo and Bruno's Bossa Rhumba. Three short movements each needing a higher ability, from Intermediate to Difficult. Alternative parts in Bass Clef, Tenor Clef and Bb Treble for Trombone 1,2 & 3, and Bass Clef and Eb Treble Clef (tuba) for the Bass Trombone, are all included.